You are not dreaming! 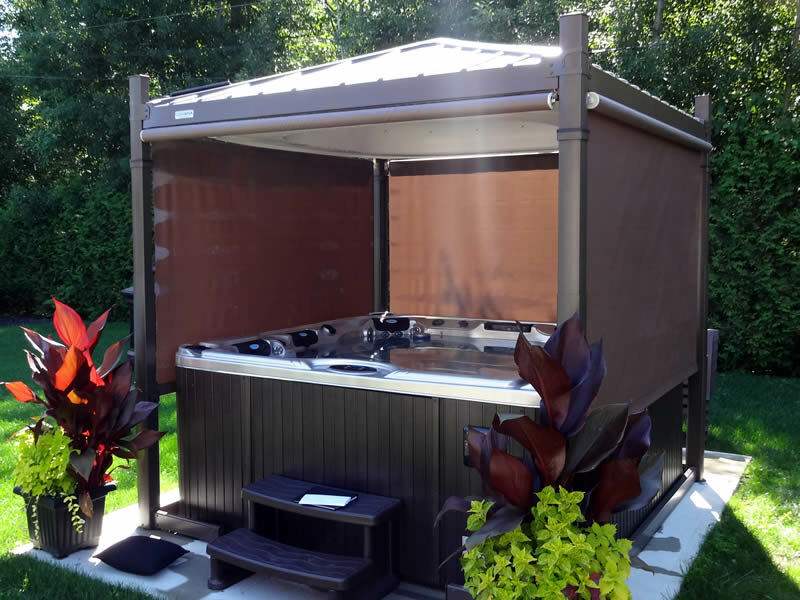 The Covana OASIS is not only a hot tub cover, it’s also an automated, state-of-the-art, easy-to-use gazebo! 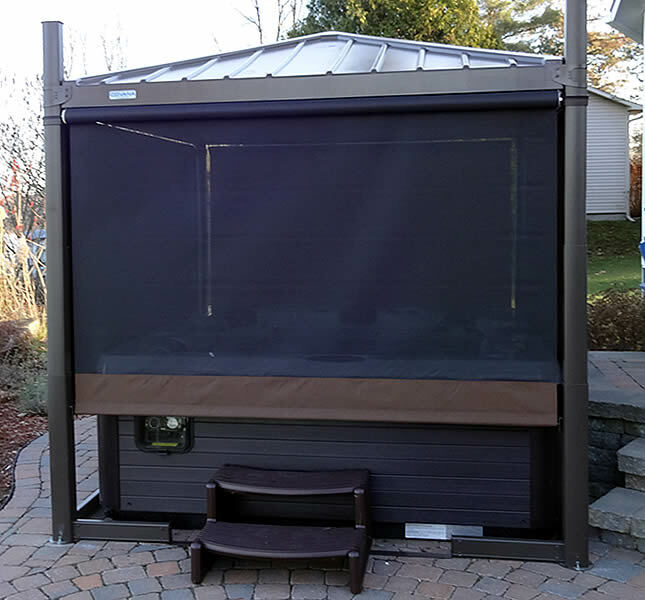 Open: Within 20 seconds, you have a modern, elegant gazebo that protects you against storms and harmful ultraviolet radiations, providing you with an intimate, private space where you can dream, think and reflect, thanks to retractable shades available as an option. The DEL lighting system was designed to create a warm, friendly atmosphere and relaxing ambiance based on a combination of 7 carefully-chosen colours. (Optionally, this system can be powered from stored solar energy!). 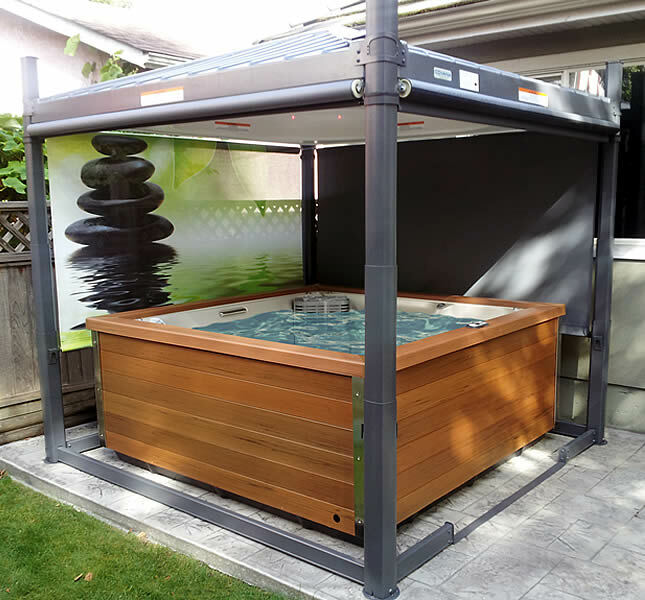 The COVANA replaces the conventional cover and seals over spas tightly to eliminate any water or chemical evaporation. 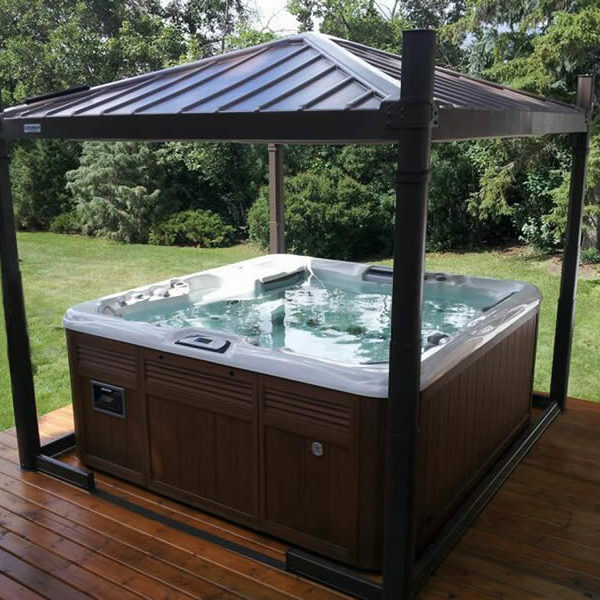 The tight seal locks in heat and locks out cold to reduce costs related to heating the spa by up to 30%. 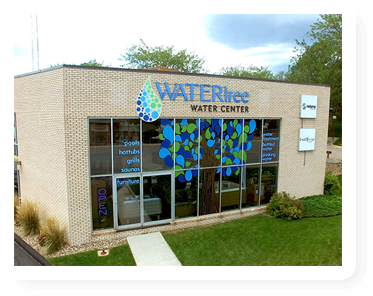 The COVANA has the highest R Value in the industry with an R-21 insulation value. Key operated, you safely control when the COVANA is in the up position. A great gazebo that will withstand wind, rain and heavy snow. 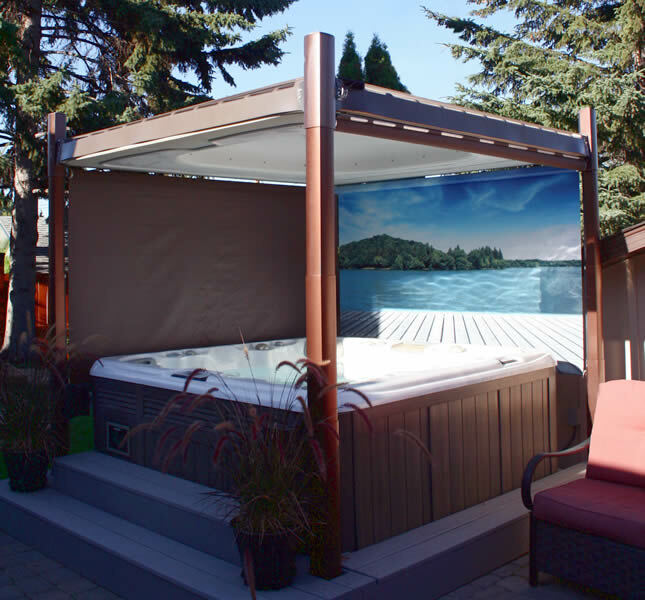 Perfect for year-round tubbing in the Pacific Northwest! Plus, it comes with a 10 year warranty! Need extra privacy? No problem! You can add on privacy screens or shades for as many sides as you like. Create your own oasis with Covana’s special Mural Zen Screen or Mural Island Shade. One of our most popular add-ons. Available in both Slate & Mocha to match your OASIS, the shades provide additional protection from the wind & harsh elements. Most importantly the shades provide coveted privacy from curious onlookers. 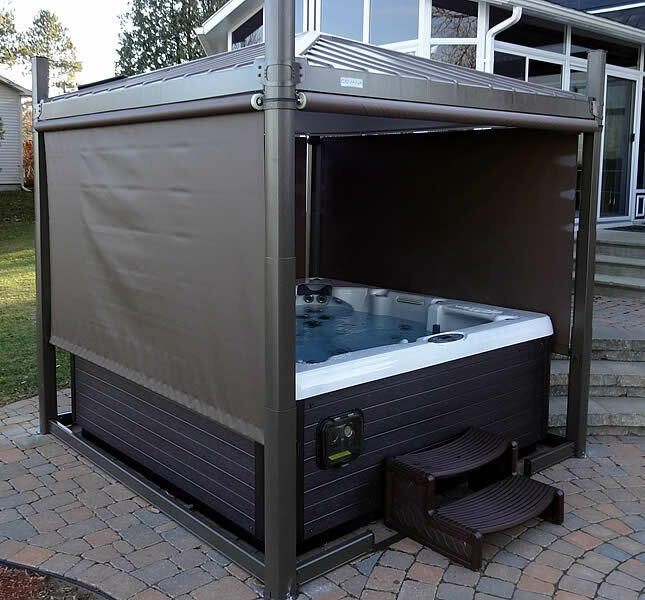 When the shades are lowered you have the added benefit of a gazebo enclosure & still the ease of use of the automated cover system. The OASIS screens are a mesh material similar in concept to that of a window screen. 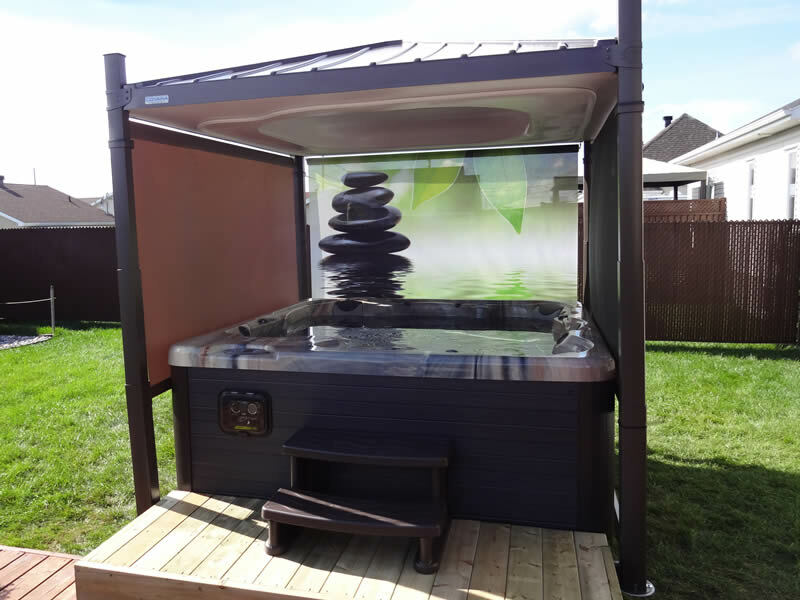 They offer privacy and at the same time allow you to see what is happening in the area around your hot tub. 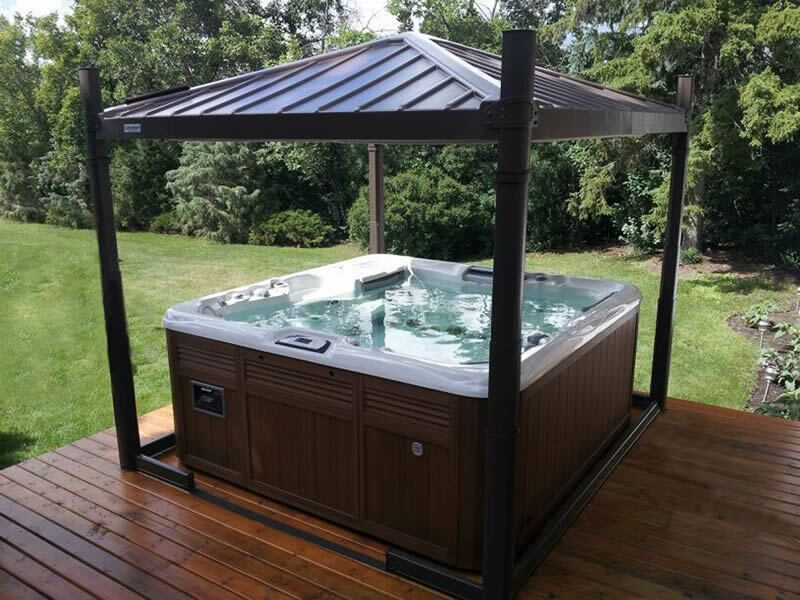 Imagine you and your friends sitting in the hot tub out of the glaring sun but able to see the children playing in the pool in front of you, while inhibiting pests like flies & mosquitoes. Available in Slate & Mocha. The Mural Zen Screen provides a dramatic view from the inside and out of the OASIS. The Zen Mural offers a peaceful mood to the environment. Escape to your private island with the Island mural. Let your imagination explore the environment as you find yourself relaxing on the dockside. The solar powered LED lighting is designed to deliver mood, warmth and ambiance. 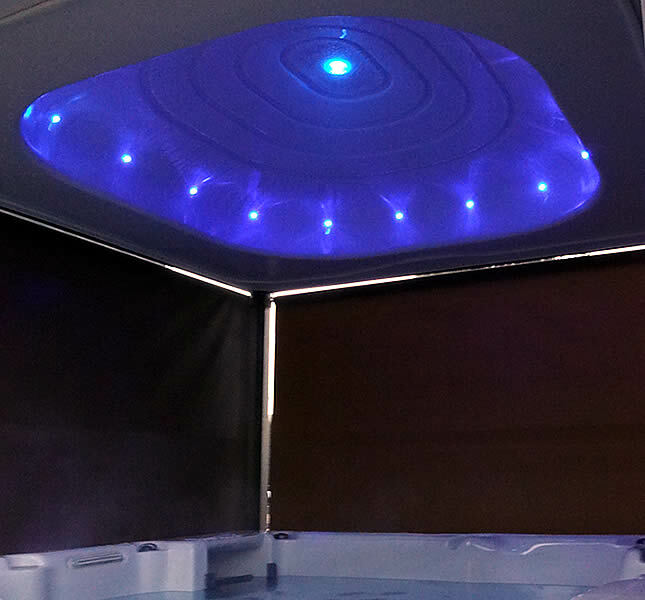 The lights give a dramatic effect by delivering color changing modes to enrich the atmosphere of your spa experience. 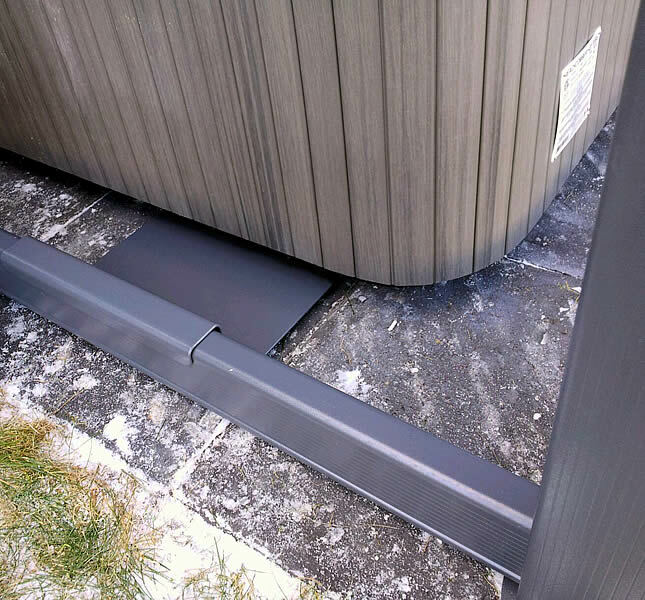 The Mounting Plates are a non permanent way of eliminating the need to bolt down the OASIS, and ultimately alter the existing surface of your concrete or deck patio. The weight of the spa securely holds down the OASIS in place.